Enhance IT operations through big data, machine learning, and visualizations. With increasing amounts and variations of data, IT operations leaders will need to look to adopt artificial intelligence into their IT management solutions over the next 5 years. Devo is listed as one of 23 vendors in Gartner's 2018 Market Guide to AIOps Platforms. 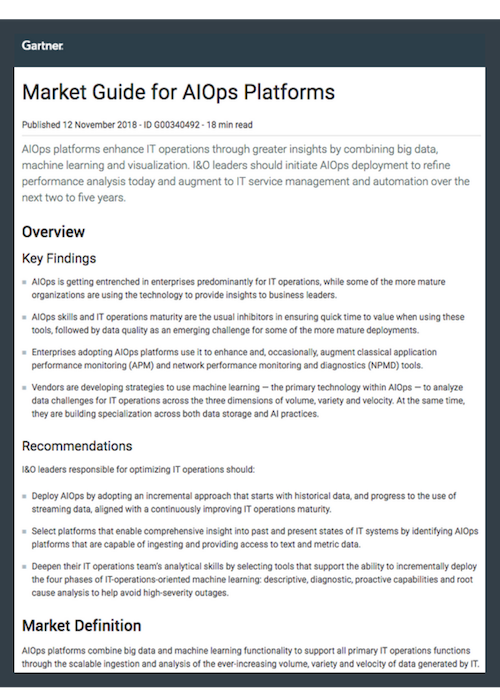 Download the full report to read about AIOps market direction and recommendations in choosing an AIOps platform. Ensure success in the deployment of AIOps functionality by adopting an incremental approach. Select an AIOps platform that is capable of supporting a broad range of historical and streaming data types. Choose tools with the ability to systematically progress across the four phases of IT-operations-oriented analytics and machine learning.